Lamous is resistant to stains and dirt. Even when soiled, stains and dirt can be easily wiped off. Lamous can also be washed or dry cleaned, allowing you to keep it clean and sanitary at all times. Smooth the naps down with a garment brush. Wipe thoroughly down with a cloth moistened with lukewarm water. Lightly patting with a cloth moistened with lukewarm water. If necessary, please use neutral detergent. 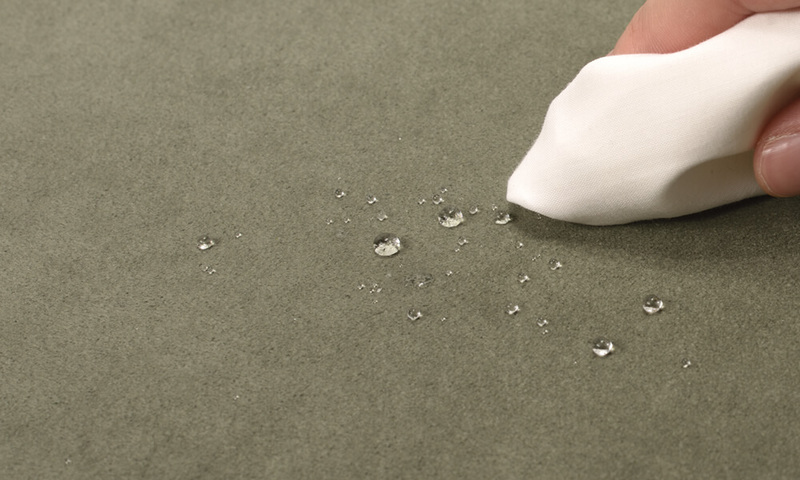 As a finishing, removing residual detergent by wiping thoroughly down with a moistened cloth. As described for non-oily soiling, but if necessary followed by patting the stained parts with a cloth with ethyl alcohol. *According to the type of stain, in some cases, the stain may not be completely removed. Lamous is washable and dry-cleanable. *Be careful with secondary materials such as decorations and zippers. Please check handling instructions on the product. Lamous may be machine washed on a delicate wash setting using a neutral detergent, at a maximum water temperature of 30°C. Gently wring the material after washing. Wherever possible, avoid using a spin drier. Hang the material out to dry in the shade, and avoid tumble drying. Petroleum-based dry cleaning is recommended. Hang the material on a hanger. Iron the reverse side of the material (or iron it through another piece of cloth) at a low temperature of 80-120℃.